How do you get to Manhattan? Is it by car? Rail? Subway? Do you walk or cycle? What tunnel do you enter through? What bridge do you cross? If you ask the average New York Commuter, any of these forms of transportation are viable options to get you from the outer boroughs or tristate area. New York is home to a number of bridges. The most infamous being the Brooklyn Bridge which looms grandly over the East River. Development of the bridge commenced in 1869 thanks to the notable bridge builder and designer, John Augustus Roebling. The construction was not without a few unfortunate incidences that landed those who were a part of the process in serious peril. Nonetheless, it is one of the most relevant landmarks in New York history that is visited by millions of New Yorkers and tourists alike annually. 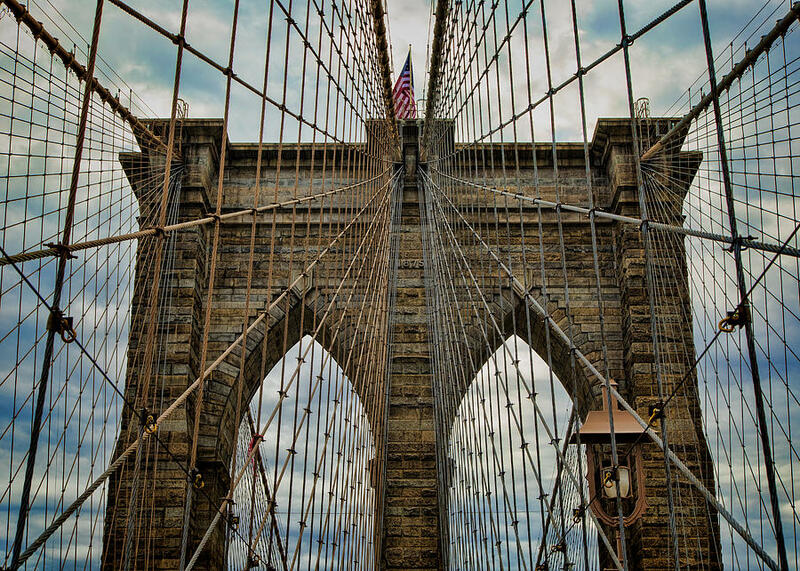 The Brooklyn Bridge is constructed from limestone, granite and cement. The addition of a promenade was a significant design choice. Why one would ask… .Because said promenade is ABOVE a busy roadway! New York at the turn of the century was bustling and busy, and the promenade gave expectations of calm and relaxation– something that seemed nearly impossible in a metropolis, but without a doubt extremely valuable. The momentous project was in hindsight an amazing achievement for its time. 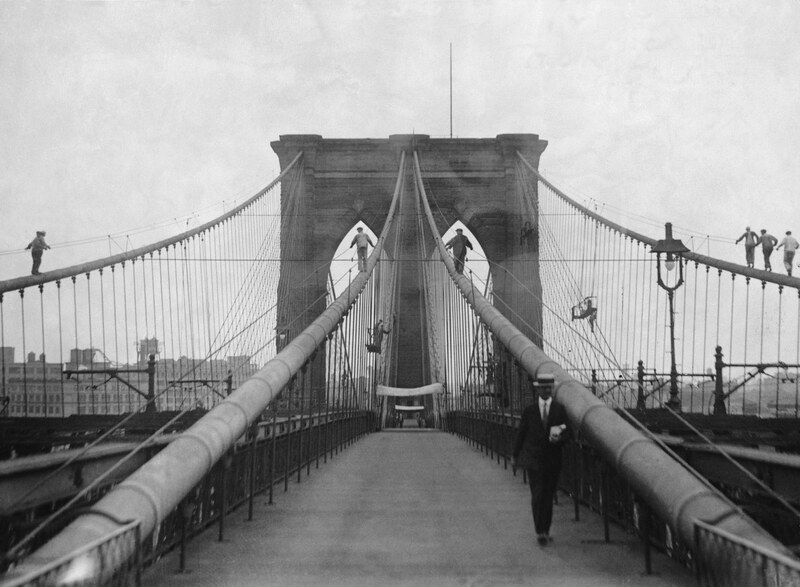 The Brooklyn Bridge was the first steel wire cable bridge in the world. The architectural style is a combination of a hybrid / cable stayed / suspension neo-gothic style bridge. With great reward comes great risk. The Brooklyn Bridge construction was one of poignant yet dangerous work. The development involved work with caissons, which supported the bridge’s large stone towers. Caissons or large wooden boxes, housed workers who would dig through the sand so the caissons had room to sink into the river. The work proved to be so dangerous that John Roebling’s son, who helped with the engineering of the project was also involved in an accident after overseeing work. He never fully recovered and needed assistance the remainder of the project. His wife Emily Roebling, stepped up and developed plans and oversaw the construction at Washington’s side. PT Barnum’s Elephant walk: To show off the safety and strength of the new bridge, PT Barnum offered to walk a total of 21 elephants, 7 camels and 10 dromedaries from Cortland Street across the bridge. Emily Warren Roebling, the wife of Washington Roebling who assisted with the engineering of the bridge after Washington had fallen ill, was the first human to make a trip across the historic bridge. Are you a wine drinker? Believe it or not, the bridge contained vaults beneath its anchorages. It was soon discovered these spaces made great wine cellars and were then rented by the A. Smith & Co. Production Company. The Brooklyn Bridge had the longest reign as the longest bridge. This title was eventually lost in 1903 to its “brother”, the Williamsburg Bridge. 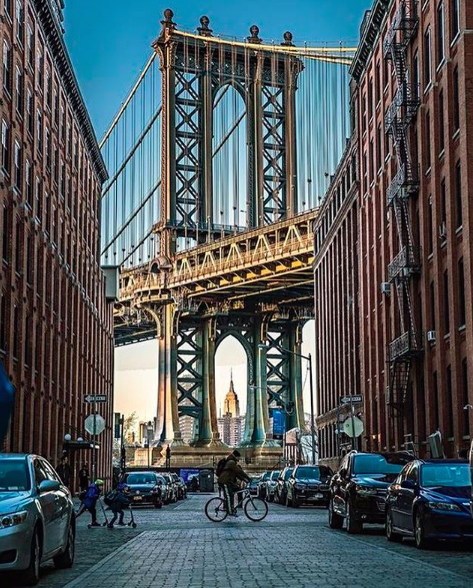 Besides being a major transportation hub, the Brooklyn Bridge today is the place to be for sightseeing, to take a summer stroll or even the perfect backdrop for your Instagram photos. The Brooklyn Bridge sees more than 120,000 vehicles, 4,000 pedestrians, and 3,100 cyclists cross each day to get to work, school and home. A sturdy bridge (ask P.T. Barnum) with an even stronger history, bridges two of our favorite boroughs forever. Join us every week for Street Evolution. We profile a New York City area/street and explore the amazing history it has to offer! Have a suggestion for a Street Evolution topic? Share it in the comments!